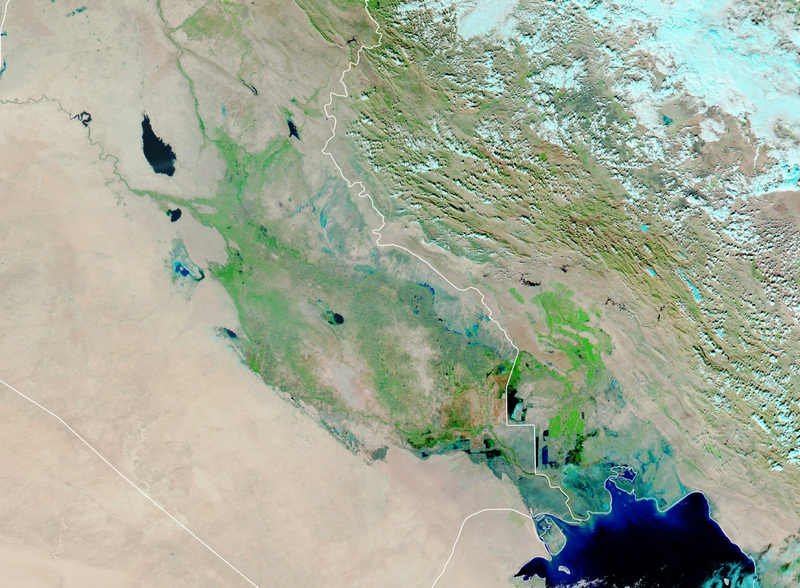 While November typically brings wet weather to Iraq, November 2018 brought even more frequent and intense rain storms than usual. 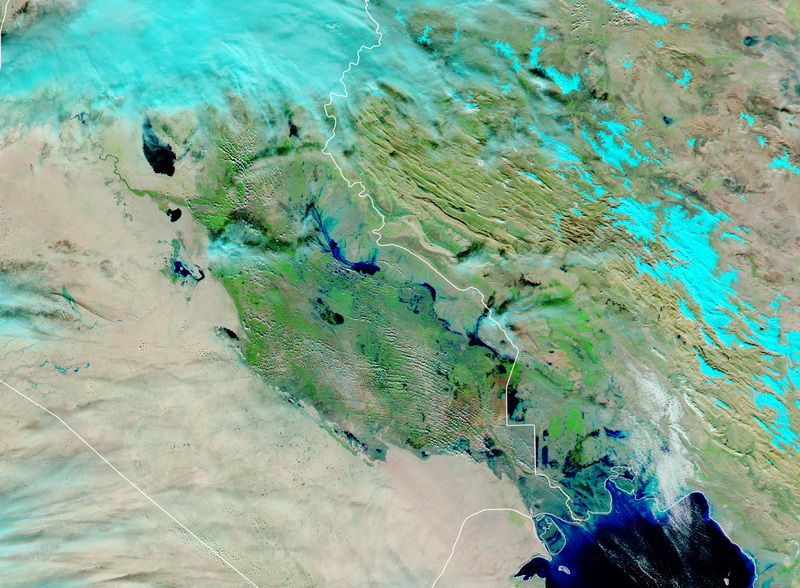 On November 22-23, an especially potent storm dropped torrential rains across northern and central Iraq. 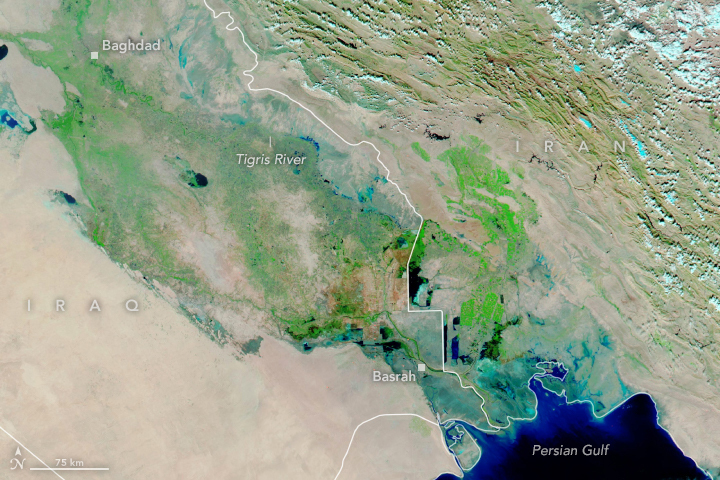 The resulting flash floods have taken several lives, injured hundreds, and displaced tens of thousands of people, according to humanitarian organizations. Hundreds of homes have been destroyed, particularly in towns north of Baghdad, according to news reports. 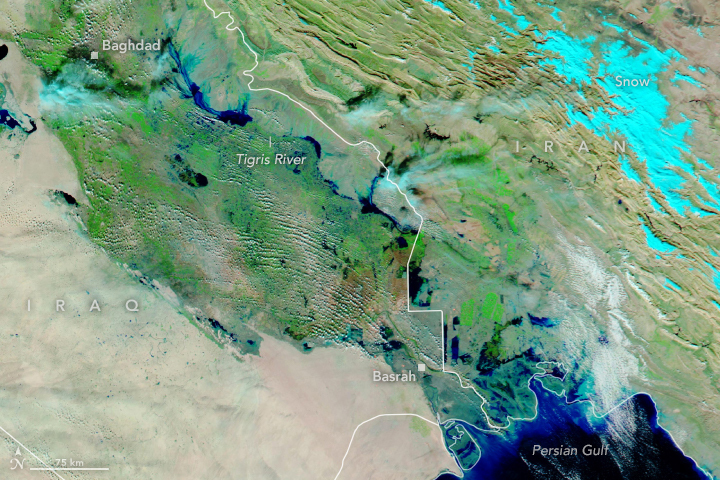 On November 27, 2018, the Moderate Resolution Imaging Spectroradiometer (MODIS) on NASA’s Aqua satellite acquired an image (top right) showing water pooling in the floodplains of central and southern Iraq. 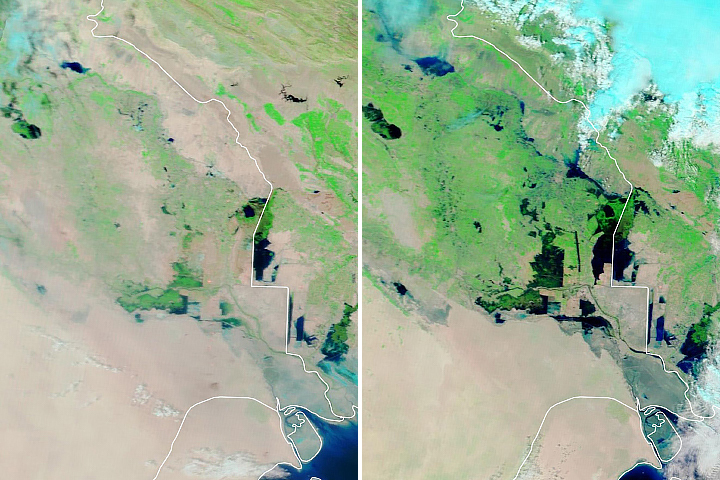 The left image shows the same area on October 28, 2018, before the rains arrived. 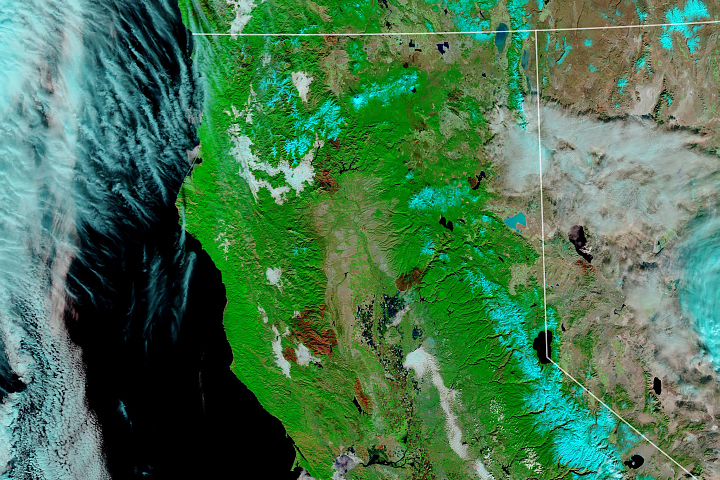 The images were both composed in false color, using a combination of infrared and visible light. 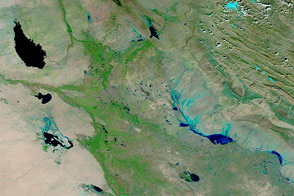 Flood water appears dark blue; saturated soil is light blue; vegetation is bright green; and bare ground is brown. 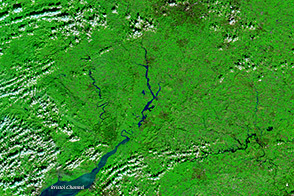 This band combination makes it easier to see flood water. Forecasters are warning that another storm system is poised to bring more downpours and flooding in the coming days. 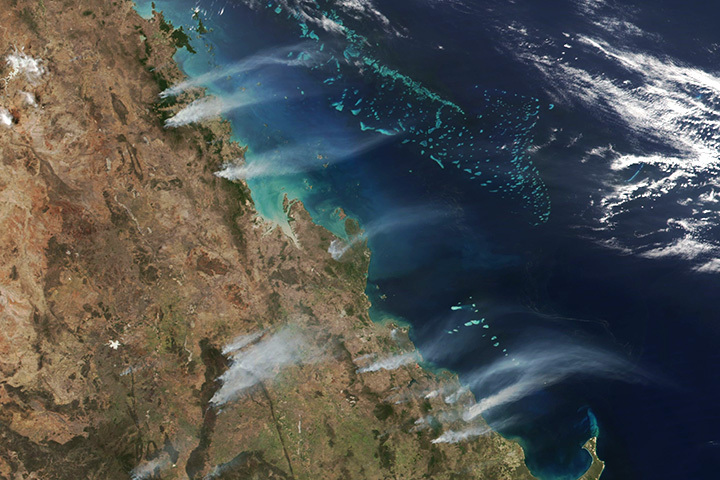 NASA Earth Observatory images by Lauren Dauphin, using MODIS data from NASA EOSDIS/LANCE and GIBS/Worldview. Story by Adam Voiland. 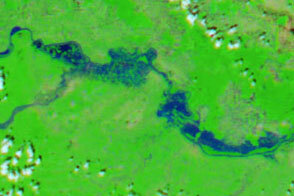 November flash floods displaced tens of thousands of people. AccuWeather (2018, November 24) Heavy rain, deadly flooding to continue across the Middle East into Sunday. Accessed November 27, 2018. AccuWeather (2018, November 26) More storms, flooding on the way for the Middle East this week. Accessed November 27, 2018. Arab News (2018, November 26) Emergency workers in Iraq struggle to help flood victims. Accessed November 27, 2018. Aljazeera (2018, November 23) Iraq: Seven killed, thousands displaced in flash flooding. Accessed November 27, 2018. Reliefweb (2018) Iraq: Floods - Nov 2018. Accessed November 27, 2018.